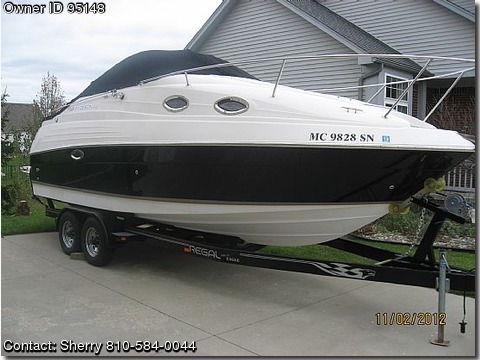 Contact the owner @ 810-584-0044 or ptframe@comcast.net.Freshwater 2004 Regal Commodore 2465 Volvo 5L GXi duo-prop stainless steel, 270hp apx 280hrs, Trim tabs. Regal 2465 Commodore, fuel-68gal, water-16, waste-12gal, draft-3ft. Equipped w/ two batteries, battery charger w/battery switch, battery Isolator, halon system, bimini top w/enclosure, cockpit cover, full cockpit snap-in carpet, 110v dockside power, Kenwood stereo system, marine head w/holding, full galley w/microwave, fridge, stove alcohol/electric, VHF-radio, GPS/plotter, D/finder, compass, Sleeps 4, foredeck sun pad, cockpit filler cushion, cockpit table, large swim platform, V-Birth table, white bottom paint. Matching black Eagle Trailer w/duel axle & brakes.